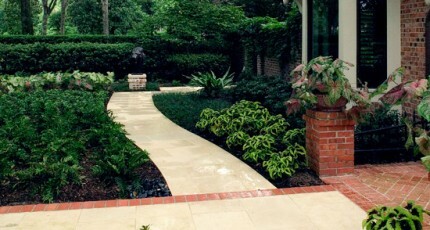 Houston area landscaping by Exterior Worlds offers the full range for professional landscape services. These services range from consultation, design, installation, outdoor building construction, and lawn and garden maintenance. 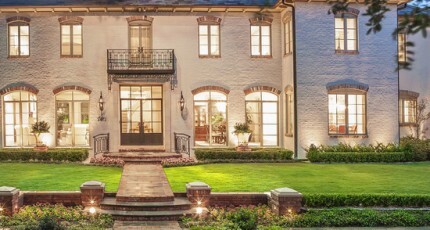 Many Houston area landscaping business specialize in one or two or these subdisciplines, but Exterior Worlds makes it a point to multi-specialize in all of these things at the high end level of the landscape design and landscape architecture spectrum. Houston area landscaping occurs in one of the most difficult and challenging climates in the United States. The terrain here is almost totally flat and easily floods. Careful attention must be paid to landscape grade and drainage systems that will siphon off excess rain water before it can damage outdoor structures and kill sensitive grasses and garden plants. Still, there are more landscape design positives to be found in Houston as there are potential negatives. The warm, near-tropical climate makes this area ideal habitat for almost any exotic plant species you can imagine. Abundant rainfall allows for a variety of seasonal and perennial species to flourish in garden designs of all kinds and flower beds extraordinaire. Our team specializes in helping people who have a vision of a landscape just for themselves, but lack the time and skills to build that landscape on their own. We begin by helping people articulate ideas that come to them in the form of visualizations and epiphanies. Sometimes it’s something quite simply like a picture cut out from a magazine. At other times, it may be the memory of the yard owned by a friend or a relative. Still other people actively search the Internet for do-it-yourself landscaping ideas, and then call a professional when they realize that some of the projects that begin as simple improvements could, with a little more investment and professional touch, transform the entire aesthetic of their outdoor living space and significantly raise the value of their property. However, there is much more to truly professional Houston area landscaping than colorful gardens and innovative softscape designs. Landscape architecture plays a key role in differentiating true residential landscape design from lawn and garden landscape maintenance. The intent of landscape architecture is to subdivide the property into special zones of aesthetic and activity. These zones play key roles in establishing the atmosphere of Houston outdoor living as an expression of personal, homeowner lifestyle. They also provide foundational space for custom hardscapes and special outdoor structures that function as areas of interests and locations for special events. For example, the Houston area landscaping specialists on our team always include a custom swimming pool and patio design in the landscape master plan. If a pool already exists, they will encourage either a remodel or a renovation of the pool and patio area to better support the architecture of the home and accommodate the specific interests, preferences, and anticipated numbers of guests in attendance at poolside events. Outdoor fireplaces and summer outdoor kitchens are also popular structures that characterize luxury Houston area landscaping. Such accommodations bring the amenities of custom home interiors into the exterior world of outdoor design. Decorative elements such as trees, flowers, shrubs, water fountains, gazebos, and arbors can then be added at will to create an outdoor world of personal sensibility equal in value and comfort to the world enclosed behind home walls. Houston area landscaping designers who work on this level are so much more than gardeners and lawn maintenance professionals. They are degreed professionals whose training includes botany, irrigation science, construction, and outdoor lighting techniques.